It had been five years since I’d been in Israel and last seen Bili’s parents. 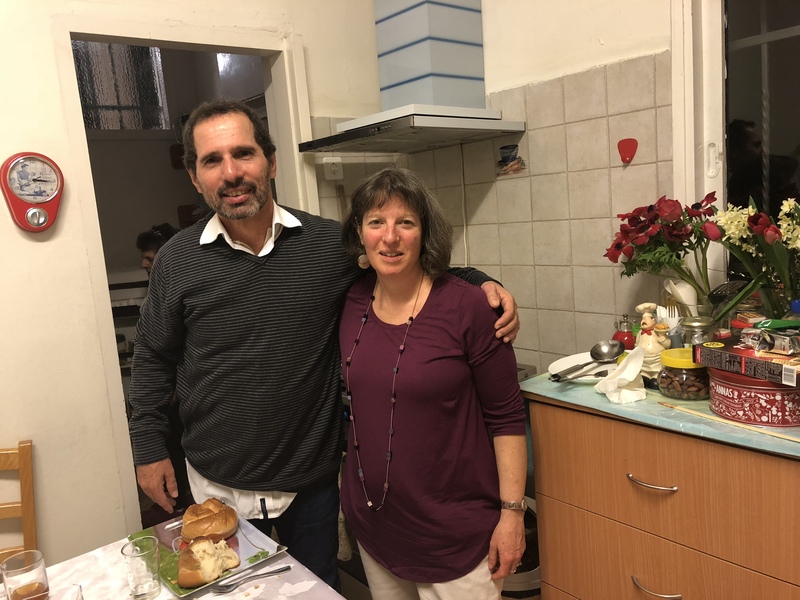 They first met me as a 20 year old college student, and welcomed me into their home Shabbat after Shabbat, helped me hone my Hebrew (Yafa speaks no English, and Shmuel speaks some), taught me to love the forest behind their home and the beauty of the land of Israel. 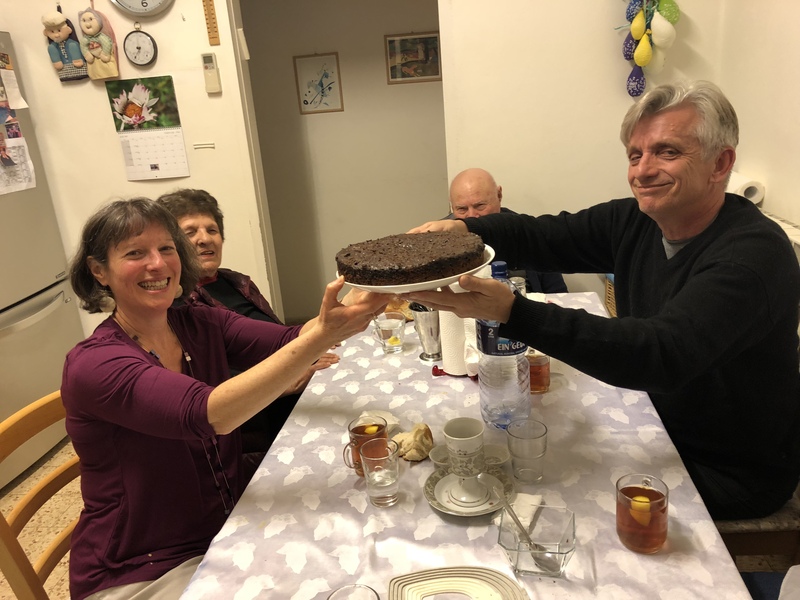 Seeing them last night for Shabbat dinner was like coming home — a place of total acceptance (and amazing food). 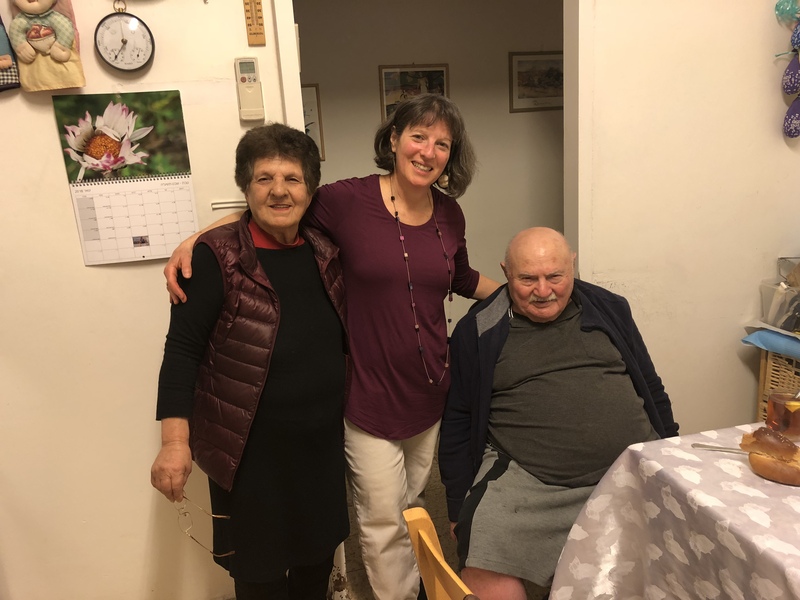 Yes, we were all a bit older, and yes, we had our heated conversations about Reform Judaism and Donald Trump (whom Bili’s father and brother consider “good for Israel”), but I knew that I was heard and valued. Before I left, Yafa told me that I am her American daughter, which made me cry. This morning Bili wouldn’t let me into the kitchen as she whipped up an amazing Israeli birthday breakfast of borekas, salad, fresh orange juice, bitter orange marmalade, a gazillion sides, plus a strawberry cake. Only the pomegranate and the salad are on my Weight Watchers “zero point” list, but there are no points to count on birthdays anyway, right? We (Bili, Mats, their friend — and my new friend —Tali, their dog Hunter, and me) then took a road trip in search of wildflowers, Bili’s weekend passion. She gets news alerts from her botanical club of where things are blooming when, and she goes running, taking loads of photos that she posts each week on Facebook. We went to both the Mata Forest and to the Adulam-France National Park where we saw a lot of red anemones, cyclamen, and, of course, the almond trees in blossom. 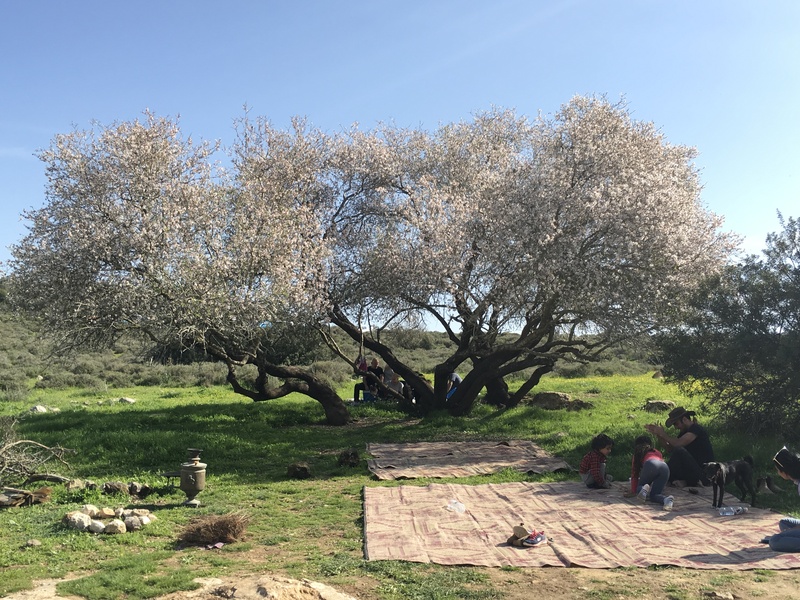 We are actually in a winter heat wave in Israel so Bili is a bit afraid of what this will mean for the wildflower blooming “schedule,” but this is always the best month in which to see spring “spring” in the holy land. A glorious day concluded with another Bili feast and binge watching of a British series “Unforgotten,” a phone call with my sister, email and Facebook wishes from friends near and far, and a true sense of feeling younger, not older. So grateful for this 48-year friendship with Bili. Penpals since age 10 and so many great memories from many (though never enough) different trips to Israel. Thanks, Bili and Mats, for making today another wonderful memory for the archives of my blessed life. Sounds like a fabulous birthday. You deserve it. I’m so glad you had such a beautiful birthday! I wrote that before looking at your email or even the title….but I was right!